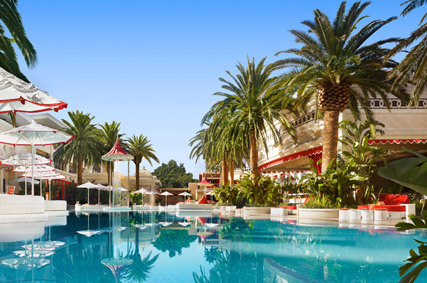 With a clutch of outstanding world class hotels situated along Las Vegas’ famous neon drenched strip you may think that you’d struggle to pinpoint one as the best, and yet the Wynn Hotel provides such a luxe and jaw-droppingly-good experience that it’s a clear frontrunner for us. Las Vegas hotel supremo Steve Wynn (he also built the strip’s Bellagio, The Mirage and Treasure Island, among others) spent a whopping $3billion to create his eponymous hotel, and visitors can see evidence of the investment at every turn. Unlike many of the other Sin City establishments, the Wynn doesn’t have a theme, which makes for a far more glamorous and classy stay. In fact, the hotel and its sister property, Encore Las Vegas, collectively hold more prestigious Forbes five-star awards than any other resort and casino in the world. Impressive stuff. 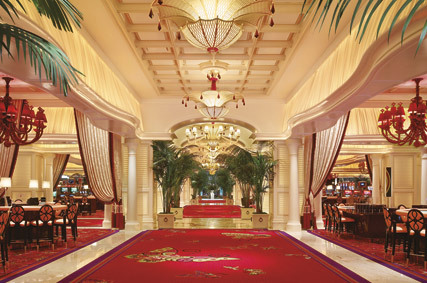 From the moment you enter through the Wynn’s doors and into the tree-lined lobby, the hotel just screams luxury. From the modern yet homely rooms and Michelin-starred restaurants to the award-winning nightclubs, sprawling swimming pools and designer shops, the Wynn has it all under one roof. Based on the northern tip of the famous strip, the Wynn boasts a total of 2063 rooms, 630 suites (executive, parlor and salon), 24 apartments and 18 villas. 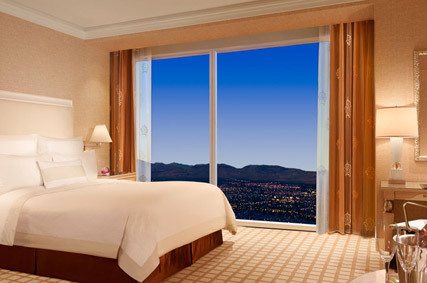 The rooms are plush with super-comfy king size beds and large floor-to-ceiling windows on one side, which offer spectacular views of either the Nevada mountains and golf course (on the east) and the Wynn mountain and waterfalls (on the west). All rooms are contemporary and decorated with neutral creamy tones and come complete with air conditioning, flatscreen TVs, wireless internet, fax machine and minibar as standard. The bathrooms are luxe and roomy too, with deep tubs, power showers and his ‘n’ her sinks, as well as giant mirrors, hairdryers and more flatscreeen TVs. For those that really want to push the boat out, the suites offer an even more luxurious stay, with add-on living areas and en suite massage rooms to name just two extras, which are perfect for group bookings. 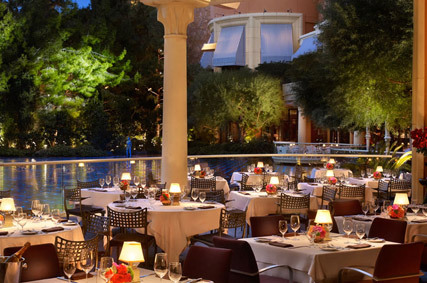 Las Vegas may not instantly spring to mind when thinking of leading culinary cities, but that may be because you’ve never eaten in the Wynn. With a total of seven fine dining and six more relaxed eateries, plus five bars, foodies will be spoiled for choice here. For fine dining, the Michelin-starred Chinese restaurant, Wing Lei, should be first on your must-visit list. This decadent Shanghai-inspired restaurant offers the best of Cantonese and Szechwan cooking in a truly special setting. Elsewhere in the hotel, head to the SW Steakhouse for hearty meaty fare, Stratta for rustic Italian-American cuisine, Lakeside for al fresco seafood, La Cave for hot and cold sharing plates, The Country Club for a spot of lunch and Bartolotta Ristorante Di Mare for Italian-style fish dishes. If that’s not enough to please your tastebuds, the neighbouring Encore also houses Sinatra, the Ol’ Blue Eyes tribute Italian, Botero for steak in a contemporary setting (the best steak we’ve ever eaten, just for the record), and Society for modern American, to name just a few. For after-hours fun, the Wynn houses not one, not two, but three state of the art nightclubs – XS, Tryst and Surrender – with the adjoining Encore Beach Club offering dancing and drinks poolside. A Las Vegas hotel wouldn’t be complete without a world-class casino, and the Wynn is no exception. For serious gamblers and dabblers alike, the glamorous Poker Room is a must to try your luck on the betting tables. If giving your credit card a workout is more your kind of pastime, then head to the Esplanade – a red carpeted mini-mall of designer fashion boutiques, with the likes of Chanel, Dior and the only standalone Alexander McQueen store in the whole of the US housed here. The only downside of the hotel is that with so much on offer it’s impossible to squeeze it all into one trip. Ah well, we’ll just have to go back! 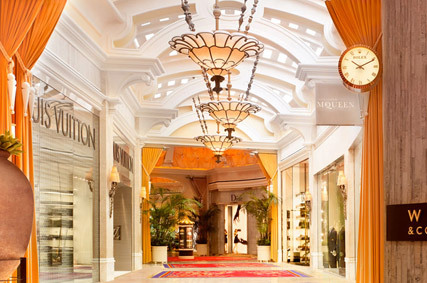 Wynn Hotel, 3131 Las Vegas Boulevard South, Las Vegas, Nevada 89109. Prices start at $169 (around £108 at the time of writing) per room per night for a standard room rising to $350 (£225) per night for a suite. All prices are subject to availability. Call +11(877) 321-9966, email roomreservations@wynnlasvegas.com or visit wynnlasvegas.com to book.